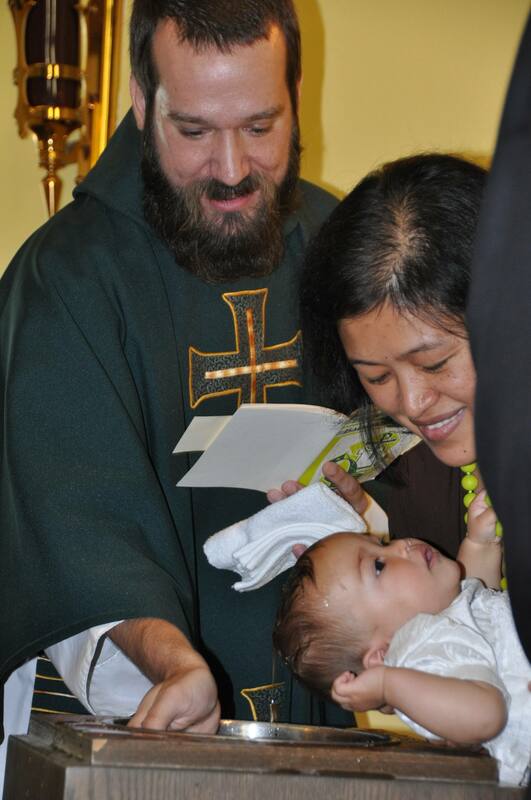 On August 11, Father Dave honored the Fielding family by baptizing Amara Juliet Fielding at St. Therese. The baptism was held during noon mass with family, godparents, year-round friends and new visitor/tourist friends in attendance. Her family consisted of parents Kent and Este Fielding, big sister Callia, and uncle/godfather Joshua DeGuzman. Father Dave had a rousing homily where he likened Amara’s baptism to a touchdown at a football game and how the coach, Jesus, would be jumping up and down and cheering her on (and Father Dave did actually do some jumping up and down). Amara’s friend, Henry, was also in the audience so the church was filled with the sound of healthy babies. After the ceremony we gathered to talk and celebrate with a huge lemon cake from Bites on Broadway and several pints of ice cream homemade by two of Amara’s godparents, Karl Klupar and Rosemary Libert. We had a wonderful time and it was a perfect day welcoming Amara into our church and God’s fold. Thank you, Father Dave!